The 2012 Nissan Rogue Review: With the growing popularity of compact crossovers, especially from Toyota, Honda and Ford, Nissan needed a competitor, so they introduced the Rogue a few years ago, below the midsize Murano. The Murano, introduced in 2002, is considered a pioneer in the crossover trend away from truck-based boxy vehicles. The Rogue’s look is surprisingly restrained for a Nissan, home of the nontraditional Cube, Juke and Xterra. But the car takes its looks from its big crossover sibling, so it's fluid, rather than urban youth oddball or off-road chunky. There’s a pleasing smoothness to the design, with its side windows turned up like a smile. It looks friendly, pleasant and easy to live with. My Cayenne Red tester felt familiar almost from the first moment. Inside, it's plenty roomy, with plenty of comfortable space for folks and cargo. There is nearly 58 cubic feet of room when you drop the rear seats, and that’s where the utility comes in. The matte black interior in my tester seemed to be of high quality, for the market segment, with a nicely padded dash and doors. There’s silvery trim to relieve the monotony, with small touches of plastic chrome on the gauges, door handles, base of the shifter and one mysterious little tapered strip in the middle of the center dash console. Someone in the design department apparently felt it was necessary there. As I noticed in another recent tester, the speedometer is wildly optimistic, going to 160 mph! This, I believe, is purely to balance out the eight segments on the tachometer next to it. Rogues come in S and SV models, with front- or all-wheel drive. My SV test car had front-wheel drive, which for normal life, is just fine. If you’re heading for the ski slopes, or driving on dirt roads, the all-wheel drive might be worth it. It adds just 150 pounds and reduces highway mileage slightly. My car had the features you’d ask for in anything but basic transportation, power windows and power door locks (is this not standard on every car today? ), cruise control, keyless entry, illuminated sunvisor mirrors, audio controls on the steering wheel, and more. My car came with the SL package, which, for nearly $3,900, enhances the car tremendously. That means a leather steering wheel, heated leather seats, automatic temperature control, a navigation system and a Bose Premium Audio system with seven speakers and a Richbass® subwoofer. Add to that a power glass sunroof, 18-inch alloy wheels, automatic on/off headlights, and the list goes on. It makes the Rogue into, essentially, an entry-level luxury car. 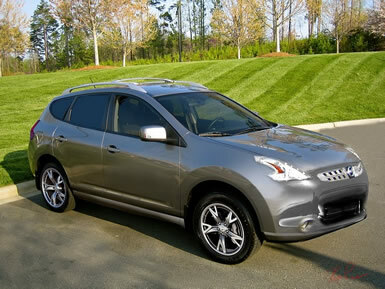 Every Rogue comes with Nissan’s 2.5-liter inline four-cylinder engine with 170 horsepower and 175 lb.-ft. of torque. It gets delivered to the wheels through the Xtronic CVT™ continuously variable automatic transmission. Nissan is big on these gearless automatics. This one uses Adaptive Shift Control to select the optimal shift pattern according to your driving situation and driving style, using input from driver operation, vehicle speed, road gradient, turning condition and acceleration. There’s a new Sport Mode this year to make it feel more energetic, but it will cut into your fuel economy. Fuel economy per the EPA is 23 City, 28 Highway, averages 25 mpg. My recorded average was kind of low, just 20.7 mpg. Maybe I'm being lead footed, but I don't think so. Although this car is considered “compact,” it still weighs more than a ton and a half, and Nissan made sure to build it just a tad larger than the competition to make it appealing. The EPA’s Green Vehicle Guide rates the front-wheel-drive Rogue at 6 for both Air Pollution and Greenhouse Gas, just enough for a SmartWay designation. Confusingly, there is one rated at 5 too, so you should check to be sure you’re getting the ULEV model and not the LEV. The Rogue flies virtually silently along the freeway, darts in and out of traffic with a gentle tug of the steering wheel, and never feels out of breath. The Bose audio system sounds great, but the continuously variable transmission makes that gearless moan that's not very sporty sounding. Pricing starts at $22,390 for the front-wheel-drive S model and head up to $29,990 for the all-wheel-drive SV with the SL package. My front-wheel-drive SV with SL package came to $29,005, with floor mats and splash guards. Prices include destination charges. The window sticker contains this slogan: “More than you expect. Everything you deserve.” I wonder who crafted that. Other than the lower than expected fuel economy, I guess it does sum it up. This is a car to enjoy in the daily haul, and with the rear seats dropped, it can schlep a plenty. But it's not an enthusiast's ride. Nissan offers other cars to meet that need. Column Name: More than you expect. Everything you deserve.